After years in the triple digits, oil has come crashing down. That's good news for some, bad for others. Suffice it to say, the fears of peak oil are now dead and buried under millions of barrels of shale oil. This is as global oil producers are now pumping out more oil than ever before, so much so that a glut of oil is sitting in storage tanks around the world. This oversupply has had a major impact on the price of crude, which has been cut in half over the past year. For some, this is good news, while for others, not so much. Here is a look at some of the pros and cons of sub-$50 oil. John Rosevear: Here's something that could be either a pro or a con, depending on your portfolio (and your automotive tastes): SUV sales are soaring, and sedan sales are slumping. This is about more than cheap oil. Today's SUVs are (mostly) not like the heavy, truck-based gas guzzlers of a decade ago. They're constructed more like cars, with more car-like ride and handling -- and more car-like fuel economy. Industry folks refer to them as "crossovers" because they "cross" SUV and sedan characteristics. A shift in consumer preferences toward these new-style crossover SUVs was already well under way when oil prices plummeted last year. But cheap gas has given the trend a boost. Sales of vehicles like Ford's (NYSE:F) Explorer (up 18% so far this year), General Motors' (NYSE:GM) Chevy Traverse (up 17%), and just about everything at Fiat Chrysler's (NYSE:FCAU) Jeep brand (the brand is up 21%) have soared since the beginning of the year. Ford gave the Explorer a facelift for 2016. Demand for the big crossover has been extremely high. Image source: Ford Motor Company. In fact, further sales growth for the Detroit automakers' SUVs may be hard to come by: The factories making such models as the Ford Escape, Chevy Tahoe and Suburban, and Jeep Grand Cherokee are already said to be maxed out. Others are very close. That's good news for Detroit: Maxed-out auto factories generate huge profits. We've seen that in the bottom lines at Ford and GM recently, and in FCA's improving margins. But not all of the automakers are loving the trend. Sales of sedans have been poor across the board this year. The Detroit brands are more than making up the difference with their SUVs, but companies like Honda (NYSE:HMC) and Toyota (NYSE:TM) are much more dependent on sedan sales. They haven't been left behind completely -- both have seen sales of their own compact crossovers boom -- but the hits taken by longtime stalwarts like Toyota's Camry (down 5% this year) and Honda's Accord (down 15%) are pressuring margins at both companies. They'll adapt to the new reality in time -- but right now, it's Detroit that is making the most of the trend. Jason Hall: While cheap oil is largely good for the economy, as it affects the price of almost everything, there's a growing part of American business that could be hurt: petrochemical manufacturing. Over the past 40 years, millions of American manufacturing jobs have left the U.S. due to a variety of reasons, ranging from automation to cheaper overseas labor to better access to raw materials. However, America's exploding production of gas from shale reserves has been turning the tide over the past few years, with chemical manufacturers on track to invest more than $130 billion in domestic manufacturing expansion. This manufacturing is expected to create hundreds of thousands of well-paying permanent jobs along the U.S. Gulf Coast, as well as boost American exports, and all because of access to cheap and plentiful natural gas. These facilities produce some of the basic chemicals used to manufacture hundreds of consumer and industrial goods, like fertilizer, tires, fabrics, and plastics, just to name a few common ones. However, many competing overseas facilities use oil-based feedstocks, not natural gas, and the cheaper oil is, the more competitive prices become. If oil were to sustainably stay cheap, and the price of natural gas were to increase -- which is anticipated based on growing demand from multiple industrial drivers -- it could weaken the strong anticipated growth in American chemical manufacturing. And that, in turn, could dampen the economic hopes of hundreds of thousands of Gulf Coast families and communities in coming years. Matt DiLallo: Playing off what Jason said, another big problem with cheap oil is the job losses in the oil industry. Coming out of the financial crisis, it has been America's economic growth engine. From the end of the recession until 2013, industry employment rose 41% to more than 2.1 million. Given the growth projections in the industry, it was estimated by the U.S. Bureau of Labor Statistics that the industry would add another million jobs by 2020. However, since the downturn in oil price, the industry has shed thousands of jobs. Oil-field service giants Halliburton and Baker Hughes have already laid off more than 27,000 workers across the globe. Meanwhile, oil producers continue to cut staff, as ConocoPhillips, for example, recently announced a 10% global workforce reduction, including 500 of its 3,750 employees at its Houston headquarters. It's a move that the company is making because they "don't see a lot of correction in the short-term... It's really kind of changing the way we work," according to a company spokesperson. In fact, Houston's economy in particular is among those being affected by the downturn. Real estate developer Howard Hughes' second-quarter results were hit by lower oil prices due to a downturn in the Houston housing market. This was because the company saw a "slowdown in single-family lot sales velocity at our Houston, Texas MPCs due to the decrease in oil prices in 2015." Meanwhile, other oil boom areas like North Dakota, which has had one of the lowest unemployment rates in the country, is seeing that rate start to creep up. The unemployment picture in these areas could get a lot worse if oil does stay lower for longer. Adam Galas: The best thing about sub-$50 oil is that it creates incredible opportunities for value-focused income investors to lock in some amazing yields on blue-chip dividend growth stocks such as ExxonMobil (NYSE:XOM). 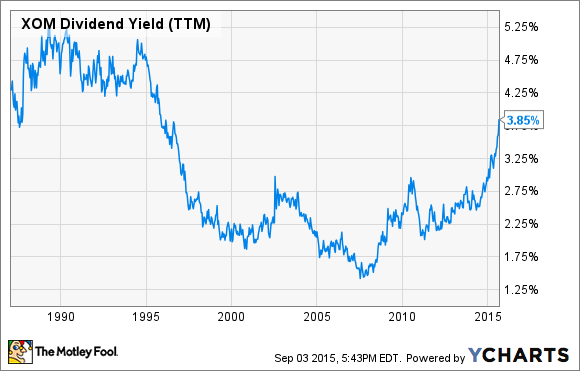 In fact, Exxon is now yielding 4%, its highest level since late 1995. Granted, Exxon's free cash flow has taken a beating due to low crude prices, and doesn't currently cover its annual dividend cost. However, the company's strong balance sheet and AAA credit rating -- higher than even that of the U.S. Treasury -- means it can afford to borrow vast amounts of very cheap debt to plug the cash hole in the short term, while working to slash costs and boost its already industry-leading returns on capital employed. Tyler Crowe: I don't know if we can say that oil in the $50 range is an absolute good or bad thing for the industry, because oil prices impact different parts of the industry in different ways. One thing we can say with a bit of certainty, though, is that this bout of cheap oil has been the swift kick in the pants that many oil and gas producers needed to become more efficient operators. As we saw a couple of years ago, any bonehead with a hope and a dream could make money in the shale game when oil prices were $100 a barrel. With prices that high, the necessity to innovate and cut costs just wasn't there. Today, some companies in the space are coming to grips with the possibility that oil may not get back to that $90-$100 range for a long time. So instead of calling it a day and going home, they are getting much better at drilling for oil on a skeleton budget. Just take a look at this graphic from EOG Resources, which is generating the same levels of returns on a barrel of oil at $55 as back in 2012 when oil prices were $95. Looking over the long term, this will make American oil production that much more resilient to commodity price swings. It may cause a lot of pain for investors and workers in the oil patch today, but I get the feeling that a couple of years from now, some of the better companies in the space are going to be thankful that this happened.